Just north of Novato, on the eastern slopes of Mount Burdell, lies Olompali State Historic Park. This gem of a local resource is often overlooked by families as they drive by on Highway 101, but it's well worth a visit. With miles of hiking trails, historic sites spanning 8,000 years of human habitation, and sweeping views of the Petaluma River Valley, Olompali has much to offer for visitors of all ages. The story of Olompali starts with the Coast Miwoks, who lived on the site for thousands of years. Olompali was one of the primary Miwok settlements in Northern California until the 1850s. At the park, you'll find evidence of their presence here in the form of a "Kitchen Rock", a large stone used as a mortar by the Miwok people to grind acorns and seeds, and a reconstructed village with redwood bark and tule reed kotchas—traditional Coast Miwok dwellings. There's also a native plant garden with educational panels describing how the Miwok used each plant for food or medicinal purposes. Evidence of the earliest European contact has been found at Olompali, too. Archaeologists have discovered an English sixpence from the reign of Queen Elizabeth I in a Miwok site there, suggesting a link between the village here and the landing of English navigator and privateer Sir Francis Drake in Marin in 1579. Olompali was also the site of the rancho of Miwok Indian Camilo Ynitia, who built an adobe house here in the 1830s; parts of the original adobe still stand today. Olompali is also famous for being the site of the only real battle of the 1846 Bear Flag Revolt. The site eventually became the ranch of the Burdell family, who build a grand estate there in the early 1900s. The estate later became a Jesuit retreat, a swim club, and a hippie commune in the late '60s. The Grateful Dead even lived at Olompali for a short time, giving true Marin pop culture cred. The Burdell Mansion was destroyed by fire in the 1969. Eventually, the site became the state park that it is today. The 19th-century Burdell frame house is now the park visitor center, which contains exhibits describing the history of the site and a small gift shop offering books, T-shirts, maps, and more. Trails lead to the remains of the Burdell gardens, including a big lava rock fountain, and to the ranch's barns and other outbuildings, which were constructed in the 1870s. The park hosts occasional programs like the annual Bat Night in August, a fun family event that features bat-related crafts and activities and a chance to see bats exiting the old barn at night, and Heritage Day in May, with living history, interactive activities, tours, and more. Olompali also offers guided family-friendly bird walks throughout the year. If you're up for a hike, the three-mile loop trail offers an easy trip through the grounds and around the lower slopes of Burdell Mountain. You can also ascend the 1,500-foot mountain by taking the longer and more strenuous Burdell trail. You can even connect with Mt. Burdell Open Space Preserve on the other side. Olompali is a beautfiul site that's fun to visit at any time of year, even if it's just to relax and have a picnic under the shade of the park's heritage oaks. It's especially magical in the late winter and early spring when the creeks and streams are running and wildflowers adorn the meadows and the slopes of Mt. Burdell. 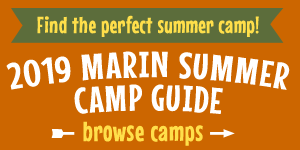 Visit and you'll see why it's one of our favorite Marin destinations. For more information, visit www.parks.ca.gov or www.olompali.org, or call (415) 892-3383. Olompali State Historic Park is located just north of Novato. To get there, take Highway 101 to the Atherton Avenue/San Marin Drive exit in Novato and head west on San Marin Drive. Turn right onto Redwood Boulevard (just past the end of the freeway overpass) and follow it to the park entrance. Olompali is open Wednesday through Sunday from 9 am to 5 pm. Admission is free, but there's an $8 per car parking fee; you can pay with cash or a check at the pay station near the entrance to the parking area. Restrooms are located in the frame house visitor center, and there are several drinking fountains around the park grounds that offer drinking water. There's no food available there, but there are plenty of picnic tables throughout the park, so pack your lunch or snacks and make a day of it. Most of the paths and trails at Olompali can be navigated easily with a sturdy off-road jogging stroller. Make sure you pack water bottles and sunscreen, as the area can get hot in the summer and not all the trails are in shade.